No Roman outfit is complete without this great accent. 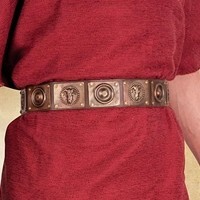 A belt that can only be worn by the Roman officer or hero. Made from harness grade leather and custom formed metal plates. Solid metal buckle and parts are antiqued fto achieve the genuine look.